Bulletproof Whiteboards And The Marketing Of School Safety It's not just the conversation about guns and school safety that's changed since the Newtown elementary school massacre — it's also the plethora of products being marketed to school districts that are typically cash-strapped but desperate to prove they're doing something to provide better security. Cold Spring, Minn., Police Chief Phil Jones (left) and Rocori School District Superintendent Scott Staska hold bulletproof whiteboards in April while announcing the school system's $25,000 investment in the shields. 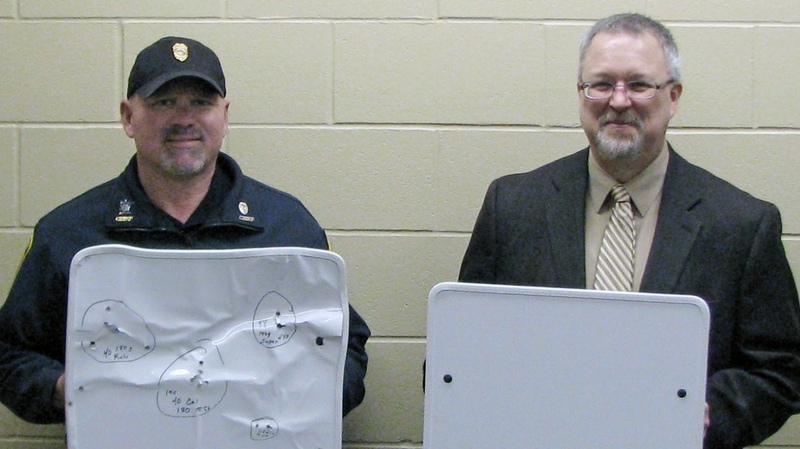 A recent news item out of Minnesota caught our eye: "Bulletproof Whiteboards Unveiled at Rocori Schools." That would be whiteboards, at the small central Minnesota Rocori School District, which will spend upward of $25,000 for the protective devices produced by a company better known for its military armor products. "The timing was right," Rocori school board Chairwoman Nadine Schnettler tells us. "The company is making these in response to the Newtown shooting, and has been making similar products for our soldiers in Iraq and Afghanistan." The $300, 18-by-20-inch whiteboards, produced by Maryland-based Hardwire LLC, "will be an additional layer of protection" for students and teachers, she says. It's not just the conversation about guns and school safety that's changed since Adam Lanza gunned down 20 students and six adult staff members at Sandy Hook Elementary School in Newtown, Conn., in December. It's also the plethora of products, including training programs that in some instances advocate fighting back, that are being marketed to school districts that are typically cash-strapped but desperate to prove they're doing something to provide better security. Bulletproof whiteboards and clipboards. Bulletproof wall panels. Bulletproof backpack inserts. Bullet "resistant" window film. Specialized locks. Training that turns the emergency lockdown, "shelter in place" response on its head. While proponents of the school safety items and training say their products provide more than just a psychological fix, critics say they need a lot more persuading. "After every high-profile school shooting, we have an explosion of gadgets, gurus and charlatans," says school safety consultant Kenneth Trump, who is openly disdainful of the bulletproof items, but more so of training programs that advocate confrontation. "Corporations see dollar signs," he says, "and believe that schools have huge budgets to buy new products and services." But school budgets are far tighter now than in recent memory, he says, with precious little to spend for whiteboards or training. "Federal and state school safety grants have been hacked at, if not eliminated," Trump says. "The pool of dollars that many vendors envision doesn't really exist." His unvarnished take: "The vendors may be opportunistic, but the people on the purchasing end aren't thinking it through, either." A post-Newtown measure that will be considered by the U.S. Senate would authorize $40 million in grants that must be matched by local school systems for improving security with measures including lights, locks and surveillance equipment, as well as for security training for teachers and administrators. The U.S. Education Department is also developing an emergency guide for schools, and the Department of Homeland Security is writing a similar one on securing school buildings. The Education Department's Readiness and Emergency Management for Schools grant program has been a victim of budget cuts, unfunded since 2011. When Hardwire LLC, traditionally a manufacturer of armor and shields for the military and law enforcement, wanted some attention for its new bulletproof school products, it's not surprising it zeroed in on Rocori. A decade ago at Rocori High School in Cold Spring, Minn., 15-year-old John Jason McLaughlin used a .22-caliber handgun to kill two fellow students. And Hardwire already had a working relationship with a local company, Cold Spring Granite, which provides material that the armor company uses in its products for bridge and building infrastructure protection. The town's police chief made the whiteboard pitch to the school board, says Schnettler. And members were pressed to act quickly, she says, to take advantage of a special offer: The granite company would donate 75 whiteboards to the district's public and parochial schools if the board agreed to match the purchase. "It wasn't a unanimous vote," Schnettler says, "primarily because Hardwire had a bit of a sense of urgency. They wanted Rocori to be the first district [in the state] to have these, and if we didn't take the offer, they were going to move on." This type of bulletproof whiteboard, produced by the Maryland company Hardwire, has been purchased by a Minnesota school district. Schnettler, who voted in favor of using $25,000 from a capital improvement fund to purchase the whiteboards, says that in hindsight she would still do the same. "I don't believe it's a waste of money," she says. "The chief showed us how to use it offensively — to block penetration of bullets through door windows, or to knock the gun out of the intruder's hands. "It buys time for your local law enforcement to get there," she says. Emily Heinauer, senior director of advanced programs for Hardwire, agrees that the whiteboards should be viewed as tools to buy time before help arrives. "During the Virginia Tech shootings and at Sandy Hook, people were throwing themselves in front of their students to protect them," she says. 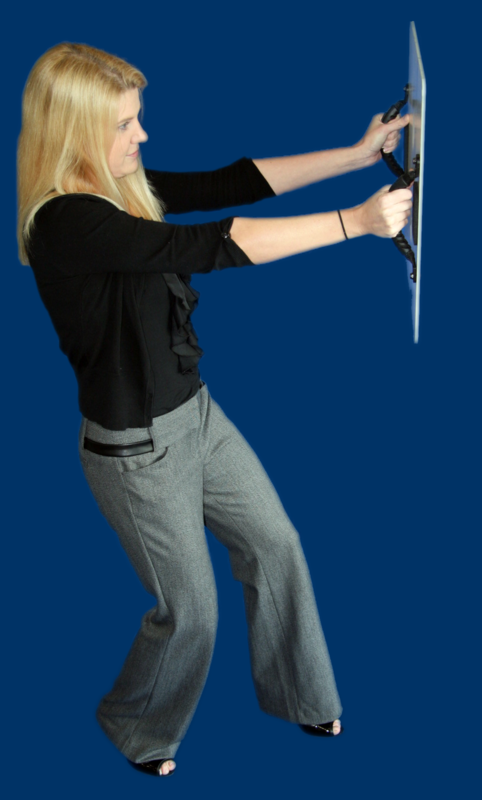 "The whiteboard is meant to be defensive," used by teachers potentially in the line of fire. Hardwire has created a nonprofit "adopt-a-school" organization through which tax-deductable donations may be made for the purchase of the bulletproof products. Heinauer says that the parents of the students killed at Rocori High School a decade ago also donated money to purchase additional whiteboards. Schools Superintendent Scott Staska, featured on Hardwire's website holding a whiteboard, did not return calls for comment. Cathy Paine speaks with authority about school security, and with good reason. She was the school psychologist at Thurston High School in Springfield, Ore., when in 1998 student Kip Kinkel shot to death two students and wounded 25 others. Paine, still a school psychologist in Springfield, is chairwoman of the National Association of School Psychologists' emergency assistance team. She says that though she understands the fear that is driving the school security market, she views bulletproof whiteboards and the like as "a knee-jerk reaction to a problem that doesn't exist." "It's such a rare event that an armed intruder will come in — there's a 1 in 2.5 million chance it will happen," she says. "We want to have comprehensive safety programs, we want to be prepared, but we should be looking at what are the likely crises." Her tack is to encourage school districts to balance the physical safety of their campuses with what she called the "psychological safety of the campus." A bigger risk to safety in schools is kids being bullied and harassed, she says. After the shooting at her school, there was a push by some for metal detectors, which the school ended up not installing. But the district did receive a federal grant through a program called the Safe Schools/Healthy Students Initiative, which was used for crisis planning, looking at physical safety and the school environment. The school system installed perimeter fencing, she says, redesigned some school entrances, and closed up others. The high school already had security cameras, which documented the shooter, gun hidden, as he approached the school. That money, however, has dried up, Paine says, as has much of the other federal money once available for school safety measures, including school resource officers. Paine and Trump, the school security expert, say they are particularly concerned with training programs that encourage, in certain circumstances, confronting armed intruders. One of the programs receiving the most attention is known as ALiCE, for Alert, Lockdown, Inform, Counter, Evacuate. It's not a new concept, Trump says, and is similar to other training — except for elements that encourage students to "distract" and "confuse" an armed suspect by throwing things at him or her, and then potentially launching a physical attack. "You put lipstick on a pig, but you still have a pig," Trump says of the training, which he and some school experts argue has been discredited before in K-12 situations, and could place children in more danger both physically and psychologically. Says Paine: "The main thing that's disturbing about it is trying to have our children understand and execute this kind of a plan. I don't think that's a situation we want them in. ... We're better off teaching our kids to evacuate quickly and safely, or to shelter in place." ALiCE and programs like it have supporters — many of whom use the example of the passengers who fought back against hijackers on Sept. 11. One of its advocates is Ridgemont, Ohio, schools Superintendent Emmy Davis, featured on the website of Response Options, which came up with the training program. She says it provides a "proactive approach, rather than hiding or waiting" when there's a gunman in a school building. Rob Slattery, a retired police officer who is director of operations at Impact Armor Technologies in Ohio, says the school protection products they make (including bulletproof whiteboards and backpack inserts) are just tools. "I wish there wasn't a need for this product," he says. "And by no means are we saying this is a solution to the problem. This is an option. To have something between you and an assailant? Anything is a positive." He says he sees it as akin to the auto industry coming up with air bags. His company has done a lot of business with lawyers, providing bulletproof clipboards and briefcases, but school products are now about 65 percent of its market. Trump, who argues that the best practices in place at Sandy Hook got a lot of children out of the building safely, says he advises schools not to waste money on whiteboards or ALiCE, but rather to invest money on resource officers, counselors, radios and cameras. "Focus on fundamentals and get back to the basics," he says. "There is a security product for every possible need that your budget will buy. The question is, is that the best use of limited resources?" But in Cold Spring, Minn., Schnettler, the school board president, says that the district was responding to parents who were concerned after Newtown. "We installed a buzzer system and locks in the elementary schools that we didn't have before," she says. "And we looked at our other security measures and other things that had to be tightened up." And they purchased the whiteboards, which will be hung on the walls, the superintendent says, if or until they are needed.